WebP � a new image format from Google. It�s actively promoted so chances are high you will encounter images of this type in the nearest future. ICNs � Mac�s file type for icons. Windows icons are supported as well. DiCom – this is mostly used for storing medical images. 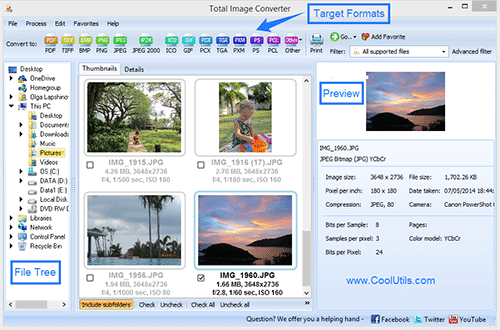 Also, we have received some complains about the speed of Total Image Converter. The developers have twisted the code and the new version processes RAW photos faster. By users� requests we have added Print option � now you can print your images right from the app. Do not uninstall the old version, the new one will use its key.